Wonder Woman had some great moments. Seeing a woman smash a soldier into mush with her shield, toss a tank over people’s heads, and commit willful acts of beautifully violent misandry was nice. But lurking below the shining feminist bastion of fists and charm lurks a very, very big problem. 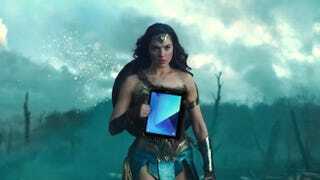 Wonder Woman uses an Android tablet. Wonder Woman gets up every day, puts on her swanky red cloak number, and slips an Android tablet, replete with keyboard case, into her little black bag. Than she goes to work and actually uses that Android tablet for work reasons. From what little I’ve gathered after watching Wonder Woman once and obsessing over it each night as I fall asleep, modern-day Diana is some kind of museum person, possibly a curator. Judging by her office, which was full of skulls and swords, she is not the kind of curator who traipses the halls of her palatial museum, glancing at her tablet every few moments. (Going by my viewings of The Thomas Crown Affair and The DaVinci Code, that’s not something curators do.) Traditionally, this sort of person would use a Windows laptop or desktop if they’re working in the non-profit sector, and a Mac if they’re not. This person would never, ever, use any kind of laptop-like tablet. The only people who use those devices are, for example, the entire cast of Grey’s Anatomy. But you know what’s not cool? Having one of those characters use an Android tablet. It’s a perfectly fine phone OS, but struggles to expand appealingly on the larger display of a tablet, and is often useless in a desktop scenario. You know who uses Android tablets? People who buy Amazon Fire tablets and...no, that’s actually it. Beyond ultra cheap Amazon tablets, Android has almost no sales, particularly compared to Apple and Microsoft. We tried to get a screenshot, but we didn’t want to get arrested by the WB police, so here is a dramatic reinterpretation. Patty, you’ve failed us all.